If you could gaze into a crystal ball and gain a glimpse of the future of medicine, care, and health, what would you see? 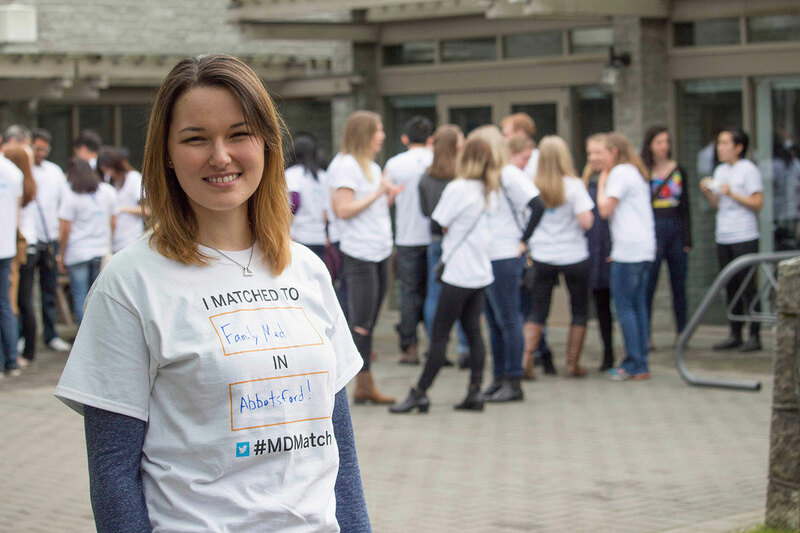 For us, here at UBC’s Faculty of Medicine, we envision a future where people from all walks of life have equitable access to health professional education and training, and where patients are at the centre of care. Each day across the province, we’re working to see this vision realized. Together, we are anticipating the changes required to create a future where our entire system — from education and research through to advanced technology and treatments — wraps around the patient. This expertise and genuine ambition to provide better care is then passed on to the next generation of researchers and health care providers, like Ellie Parton. For Ellie Parton, there was a time when self-doubt was all she knew. Growing up as member of the Wei Wai Kum band of the Kwakwaka’wakw First Nation in Campbell River, Ellie had come to believe that not all doors in life were open to her. Certainly, she thought, the keys to becoming a doctor were not within reach. At 16, Ellie learned she was pregnant and dropped out of high school. But during her prenatal visits something changed: a seed of ambition was planted — and a new sense of purpose grew from the genuine care she received from her doctors. “It was a crossroad for me. I decided I wanted to provide that kind of care to others one day, and I knew education was the key,” she says. At the same time, the expansion of UBC’s medical school was well underway. The Faculty had taken a major step in the long journey to creating environments and systems based on societal needs — including the launch of the Aboriginal MD admissions program, which offers support and encouragement to Aboriginal high school and university students considering a career in medicine. While Ellie was looking at her doctors and imagining a better future, Drs. Silke Appel-Cresswell and Martin McKeown were focused on a better future for their patients. Over the years, they have watched many of their patients slowly descend — many eventually stripped of their independence by Parkinson’s. But early diagnosis is not always easy — there is no single test for Parkinson’s. Dr. Appel-Cresswell and Dr. Mckeown working together to improve the patient experience. Beyond the tests, Drs. Appel-Cresswell and McKeown, also a professor in UBC’s Division of Neurology and Director of the Pacific Parkinson’s Research Centre, wanted to improve the experience of care for their patients. Not only were there long waitlists for specialists, but patients often struggled to remember details of their care plans after leaving the Centre. How could technology improve communication? How could we accelerate research, and turn findings into improved care? But most importantly, they wondered how could we better focus on our patients? To answer these questions, they launched the Impact on Parkinson’s Care and Clinical Tracking (IMPACCT) project. Funded by the Pacific Parkinson’s Research Institute and its community of donors, the project aims to improve patient care, reduce wait lists and enhance the relationships between research and clinical work. Only a few years in, and it’s doing just that. Average wait times are down from 24 to 7 months — a dramatic drop resulting from a myriad of factors, including the support of additional staff and allied health professionals, but also the introduction of an electronic standardized assessment that is attached to the patient’s electronic medical record. The new system means physicians can now generate a report complete with an individualized care plan that patients take home. It’s also helping to accelerate communication between Centre specialists and other health care providers, including family doctors and social workers. “It’s the human connection that really makes it worthwhile, that drives everything we are doing,” says Dr. Appel-Cresswell. The future of heath care demands innovative solutions like these. Today, the UBC Faculty of Medicine is strengthening its partnerships to push the boundaries of knowledge, shape new models of care, and inspire the next generation of health care professionals. At the heart of it all is a long-standing commitment to social accountability and better health for our communities. It’s why we have focused on advancing research in core areas of need: cancer, brain and mental health, heart and lung health, and chronic and infectious diseases. And why — in the years ahead — researchers will be exploring new and emerging areas of focus, engaging even more closely with patients and the public, and strengthening their capacity to transfer findings to patient care. Ellie Parton will graduate from the MD undergraduate program in 2017 and enter family medicine residency training in Abbotsford. The Faculty’s commitment to social accountability is also why we have expanded and distributed training opportunities for learners across the province. Why we have worked to increase Indigenous representation and create a more diverse student base, one truly representative of the rich diversity of B.C.’s communities. Our medical school is now training more Aboriginal physicians than ever before, with 50 Aboriginal students currently enrolled in the program. Ellie is one of them. Now in her final year of medical school, she is among a growing number of Aboriginal students, and well on her way to becoming a doctor. Ellie is also serving as a mentor to incoming Aboriginal students, helping others see that — with the right support and encouragement in place — bridging boundaries is possible. Each day across the province, the UBC Faculty of Medicine is making incredible discoveries, forging meaningful relationships, and helping to create the pathways to better health our communities deserve. It’s part of our ever-present contract with society.